Pop quiz: what's quiet, colourful, outdoors and only available for a few stealthy days over the summer? The Capital Reading Garden is the brainchild of Mary Beth Baker (aka @bethmaru) who first came up with the idea when she did a project on user design and public spaces in her studies a few years ago. This year, she submitted her idea to the Awesome Ottawa Foundation and received a $1,000 grant to pilot her idea. distributes monthly $1,000 awards to projects and their creators. The money is pooled together from the pockets of individual “trustees” and given up front in cash, check, or gold doubloons. The Foundation provides these awards with no strings attached and claims no ownership over the projects it supports. Awards are micro-genius grants for flashes of micro-brilliance. How kewl is that?? Until Mary Beth filled me in on her project, I had no idea Awesome Foundation even existed, let alone that Ottawa had a chapter! So, what is this Capital Reading Garden? 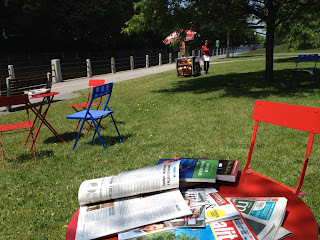 It's a pop-up (read: temporary) outdoor space with tables, chairs, books and WIFI, set up along the canal. It will "pop up" for 5 days over the course of the summer to serve as "a free, family-friendly addition to the other popular tourist attractions in the National Capital Region," according to the official website. I can think of soooooo many reasons to love this: it's colourful, it expressly serves to enjoy the outdoors and foster a love of reading (did I mention that Mary Beth is a librarian?) and it's got all-important WIFI. Let's face it, how many parks in Ottawa currently have WIFI? Not that many. (Ottawa's seriously behind on this.) And given my our addiction to being online, it's an extremely smart feature to entice the folks who still want to be logged on, even when enjoying the outdoors. I think that Ottawa needs more spaces designed to encourage people to come together physically without ignoring the fact that they want to be online. Only the truly dedicated will fully disconnect when they venture outside; so it makes sense that we can encourage the rest by enticing them with connectivity. It can even serve to move the workplace outside; meetings in public spaces are such a wonderful way to spawn creativity. And being able to connect means more people will be likely to use it. Why fight the trend to be connected? It doesn't have to take away from the experience. Best of all? The next pop-up date is this weekend! The reading garden will be open Saturday and Sunday, near the pedestrian bridge by UOttawa. Mary Beth mentioned that they are in desperate need for volunteers. Think you'd like to spend the day outside, enjoying the sun, helping out folks and surfing some free wifi? Maybe you have a student who needs some volunteer hours for school? There's a volunteer form on their site or via Twitter: @CapReadingGdn.